Seventy students are reported to have been arrested after the protests by AKU students against propaganda burial of 'unknown martyrs'. 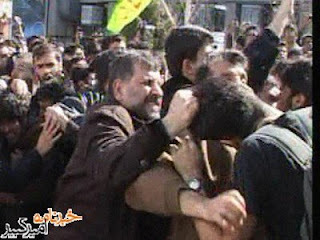 Seven are reported to be in critical condition in hospital after having been physically attacked by Ansar Hizbullah hired thugs and twenty five are hiding in the student dormitories while the Islamic regime's forces have surrounded the university but as yet have decided not to enter the university grounds and attack the dormitories, in case another 9th July student uprising takes place. Journalists, academics and students of the world, where the HELL are you? Dont bet much on the journalists or academics of the world. They are in bed with the Fascists and dictators. Basiji boro Gomsho = Basiji get lost! Thanks for the report. It's crystal clear to me that the international corporate media is the main enabler of the Islamic Republic. When the *q*ueen of England sends a congratulatory letter to the theofascists in Iran, you can't expect the media to be less servile.